Twenty years ago, volunteerism in general, and the profession of volunteer management in particular, were not often the focus of academic studies. Happily, we are emerging as a topic of interest these days from different quarters and in various countries. Even so, too often the quality of research done leaves much to be desired. We need to be more proactive in getting universities and research institutions to gather better data for us - and to engage us in interpreting what they learn. You are often asked to answer questions about your volunteer department, your programs, and your volunteers. This time, you have an opportunity to participate in a research study about your role, experiences, and support you receive as a volunteer resource manager. If you are interested, the survey will take approximately 15-20 minutes to complete. 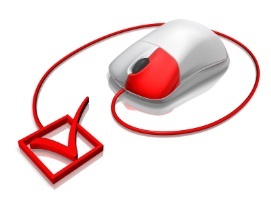 You must read the Participant Letter in its entirety before beginning the survey. Any questions about the research can be addressed to Melissa Heinlein (phone: 610- 955-7205; e-mail: m_heinlein@hotmail.com). This study has been approved by the Marywood University Exempt Review Committee. Are You Conducting a Survey? If you know of any research being done that is seeking survey respondents, interviewees, or other contributions - and is directly about volunteers, volunteer resources managers, or related issues - please let us know at info@energizeinc.com. We would be happy to post your request for input via our social media - and possibly in publishing the results in our journal, e-Volunteerism. We also provide links to dozens of published studies in the "Research on Volunteering" section of our A-Z Volunteer Management Library. 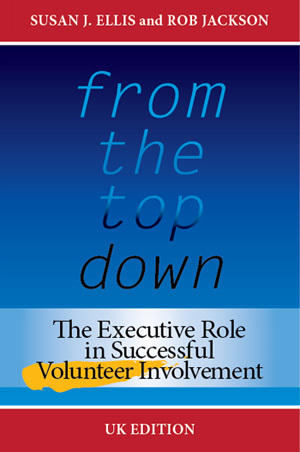 Rob Jackson has partnered with Susan to Anglicize the best-selling American book, From the Top Down: The Executive Role in Successful Volunteer Involvement. Not only has the vocabulary and spelling been converted to British usage, but the chapters on financial reporting and legal issues pertaining to volunteers have been completely rewritten by English authorities. When the book is released in September, it will be sold on Amazon.co.uk but will also be available in the Energize Online Bookstore for purchase by colleagues in Australia, Singapore, India, and other countries using British rather than American English. Come to a Book Launch Event! Susan is crossing the pond next month to join Rob for a multi-city tour to celebrate From the Top Down - UK. Events are planned in London, Manchester, Sterling, and Belfast. See the schedule and registration information at the Rob Jackson Consulting Ltd Web Site. Volume XV, Issue 4 of e-Volunteerism, our international, subscription-based journal for informing and challenging leaders of volunteers. opened on July 15th. Elisa Kosarin and two colleagues outline their successful approach to an interview method that found the best volunteers and turned around their drop-off rate. New Zealand volunteering advocate Sue Hine makes the case for understanding reflection as an important part of a cycle for continuous improvement. The table of contents for this issue promises a range of interesting and useful articles that will go live throughout the quarter, including: how a leader of volunteers can practice the techniques of coaching to sustain volunteer engagement; an Along the Web exploration of volunteer initiatives helping those with mental illness; the rise, fall and evolution of the "telethon"; and a review of research questioning whether volunteer satisfaction increases motivation to do more more. We are also introducing our new Training Designs editor, Canadian colleague, Erin Spink, who will assume this role with ways to teach about the power of volunteers through the lens of transformational leadership . As always, the contents of the previous Vol. XV, Issue 3 will remain available to all subscribers in the journal archives. of all 14 previous volume years. These and many other ways to welcome people with disabilities as volunteers can be found in The Last Virtual Volunteering Guidebook, which Jayne Cravens and I wrote last year and from which this tip was adapted.